It’s 3 a.m. Your baby has woken you for the umpteenth feeding of the night. You’re sore and you’re tired but you think, “Hey, at least I get to catch up on some reading.” So there you are, with your sweet babe nestled into her Boppy, while you do finger gymnastics trying to turn the pages of your book with one hand—until, inevitably, you lose your spot, the book goes splat on the floor, the baby snaps out of her milky reverie and starts screaming. You think: Why won’t someone just invent a book that you can read one-handed in the dark already? Dear reader, someone has. It is called the Kindle. Perhaps you already have one. Or perhaps, like me, you have a sentimental attachment to paper books. Perhaps you feel that e-readers violate the sacred intimacy between book and reader, that their tracking software intrudes on your private mind-space. Perhaps, like me, you tough it out with paperbacks and hardcovers while you nurse your first baby. And then, pregnant with your second, you realize that you no longer require the crisp and creamy paper of a “real” book; you realize that privacy is a luxury that belongs to people with two free hands; you realize that, for about $100, the one thing you really, truly need to survive those sleepless newborn nights can be on your doorstep in one to two business days. You realize that you are ready for an e-reader. So, what should you look for in an e-reader? If you want to read without having to turn on a lamp and wake up your partner, look for one that lights up. (Note: if you desperately want to wake your partner, I hereby empathize with and absolve you). 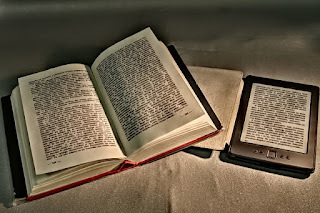 The Kindle Voyage, Kindle Paperwhite, Kobo Glow, and Nook GlowLight are among the readers with built-in lighting. You can also buy a clip-on light; there are plenty of choices under $15. Also recommended: a reader that features wireless downloading, because when you finish one book in the middle of the night, you want another one immediately, and good luck finding your USB cable with an infant attached to your chest. Do be aware that your book-buying judgment may be compromised by sleep-deprivation, and when you emerge from the postpartum haze a few months later, you may wonder why, exactly, you spent so many precious newborn moments reading Dune. Actually, I take that back. You will not wonder, because it was awesome. So, thank you, Kindle. Thank you for being there when I needed you. Thank you for 1:00 a.m. And 3:00 a.m. And 5:00 a.m. And 5:45 a.m. I do still love my real books—you know, the ones made of paper—but maybe, just maybe, I am learning to love you, too. Kate Becker is a science writer who spends most of her time writing about astrophysics, cosmology, and other mysteries of the universe, like toddlers. Read more and get in touch at facebook.com/katembecker or http://www.spacecrafty.com/. Eating and making food at the same time! The first time you pump milk you may be shocked to find out that you have to hold the cones to yourself. As you sit there for 20 minutes, bored, unable to even play tetris on your phone, your mind runs through all the things you need to do but are instead tethered to a machine making donkey noises (to clarify, the donkey noises are coming from the machine, not you). This combination of boredom and wasted time may inspire you to look for solutions advertising themselves as facilitating hands free pumping (things like the Simple Wishes Hands-Free Breastpump Bra are a popular choice in this category). I tried to make this bra work for me, I really did. But after somewhere around 5 attempts I gave up and it stayed at the bottom of my pump bag for the rest of the year. The bra was then lent to a friend who I also believe used it pretty much never. It was just too hard to get in to it in a way that it was tight enough to hold the cones, and even then, the cones never felt secure. 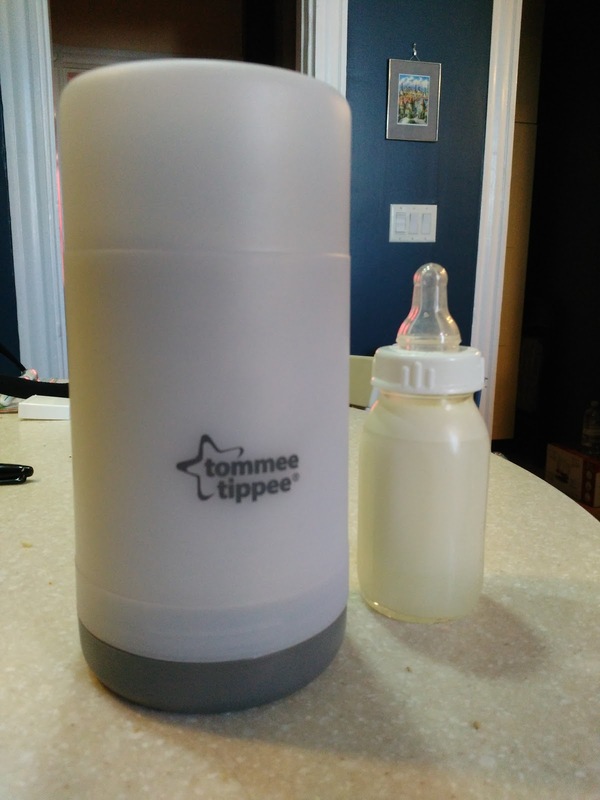 By the time it came to equipping myself for another year of pumping for my son, some very smart people had come out with with Freemie Collection Cups . 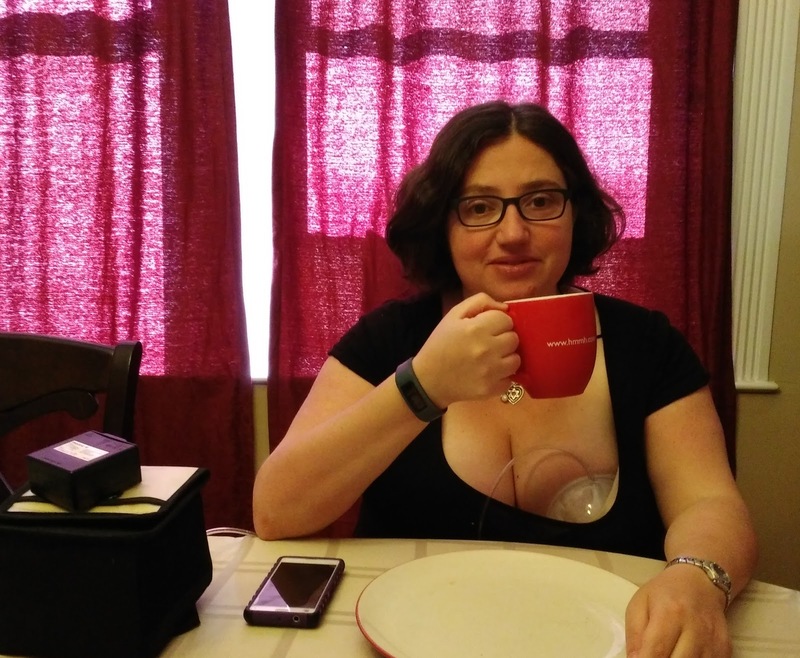 (Note: they also make the Freemie Freedom Double Electric Hands Free Breast Pump , but by now I am too loyal to my Medela Pump in Style Advanced Breast Pump to give it a try). So now, after using these guys for about a month here are my thoughts. These are a bit tricky to assemble, but once you get the hang of it they really and truly allow for hands-free pumping. I think these are awesome for occasional use. I don't think I would use them for every pumping session because one's ability to massage and pump is quite limited with them, and I would worry about my supply dropping. That said, here are the two scenarios I've used them in and been very glad indeed. 1. On the weekend my husband fed the baby a bottle at 6am, allowing me to sleep in. Then once I got up, I was able to eat breakfast with the family (pictured) while also pumping to make up for the missed feeding - technology for the win! 2. 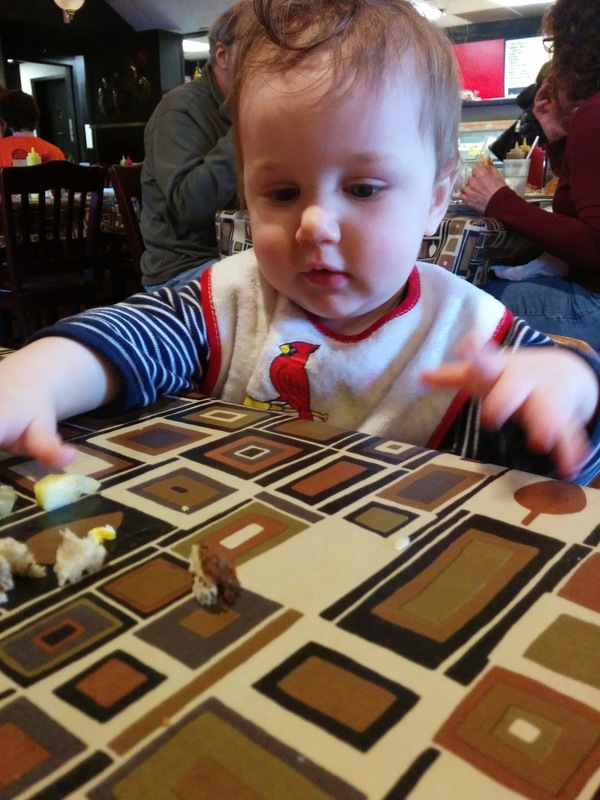 Many weekday mornings when we are in a hurry to get everyone out the door on their way to day care and work, I am able to feed the baby from one side while simultaneously pumping from the other. This allows me to make it until approximately noon for my next pumping session. Other than the potentially unfounded fear about supply drop, the only other downside to these guys is that not all the parts are rated for steam cleaning. As this is my preferred method of cleaning my equipment at work, I am mostly using them at home. That said, I think every mom can use an extra hand at work or at home, so I give these a hearty thumbs up! The most efficient method I've found for cleaning my pump parts when in the comfort of my own home is this. 1. I boil water in my electric kettle. I often start the kettle boiling before I sit down to pump for the last time that day (I keep my pump parts in the refrigerator between sessions if I am going to pump at home more than once in a day). What's great about using an electric kettle is that you don't have to wait for the water to get hot enough in your sink, nor do you have to get up to turn the stove off as you would with a stove kettle. My kettle very politely turns itself off when it's done (automatic shut off is also a convenient safety feature for those times that you start making yourself a cup of tea 4 times without actually completing the task because... baby). We have a Medelco Cordless Glass Electric Kettle . It's efficient, has automatic shut off, and is pretty and glass, though as previously mentioned any electric kettle with automatic shut off would work just as well. 2. When I'm done pumping, I take apart the parts and dump them all into a bowl in the sink (pictured). I then add some dish washing soap into the bowl. You don't need anything fancy here (or ever) like special "baby dish-washing soaps ". Just a good fragrance free soap that you use for all your dishes will do (we use Palmolive Ultra Pure and Clear Dish Liquid because I find that it gets grease off things with the least amount of scrubbing). 3. I then just dump the kettle full of recently boiled water into the bowl and go do something else for 5 or more minutes. 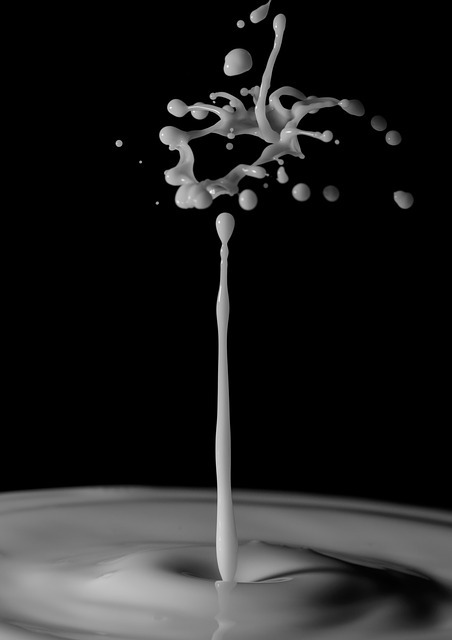 The beauty of this method is that soap + *very* hot water, means that all the milk dissipates off the plastic by itself and I don't have to go over anything with a brush. 4. If I'm going to rinse the parts right away, I turn the faucet on after 5 min and run enough water that I can reach into the bowl without burning myself. I then rinse each part and place it on my drying rack. Otherwise, I just come back to the bowl, sometimes even hours later to rinse and dry. That's it - the simplest method to clean your stuff while using the least amount of mental energy possible. If you're going back to work after having your baby, it is almost surely a mixed bag of emotions. You may be terrified of leaving your baby with someone who doesn't know how to interpret their every muscle twitch (even if that someone is your partner or mother or exceptionally well rated day care). You may be thrilled about the prospect of taking as much time to go to the bathroom as you damn well please. You may be devastated about the fact that you won't be able to cuddle your baby for hours as you have him or her fall asleep on your chest. You may be feeling all of these things and a million others, all within a matter of seconds. And yet, one thing I can almost guarantee you is that you are NOT relishing having to trudge to the company kitchen 18 times a week to scrub down your breast pump parts while looking over your shoulder to make sure the overly friendly guy from PR hasn't followed you in there... again. Some people deal with this conundrum by bringing their pump parts home every night. This to me seems like extremely risky business. What if you forget them at work one day? What if you forget them at home? You may be slightly more absent minded these days than you're used to. So play it safe and follow this step by step guide for how you can quickly sanitize your pump parts at work. 1. You only have to wash the parts once a day if you keep them in the fridge between pumping sessions. I recommend getting a storage container or disposable bowl you can pop in the fridge until you've pumped for the final time that day (hopefully you have a dedicated fridge at your job for pumping mothers). 2. Once you're ready to clean the parts, grab your Medela Quick Clean Micro-Steam Bag and your Medela Quick Clean Breast Pump and Accessory Wipes and head to the kitchen. You want to wipe down each part with a wipe, rinse under running water and place in the steam bag. If you truly want to minimize the time you spend in the kitchen, you can even wipe the parts down in your pumping room (then all you have to do is rinse and place in the bag once you're out in public). I know some people online say that they use Munchkin Pacifier Wipes to wipe down the parts but honestly, I don't know how they do it. The Munchkin wipes are much smaller, thinner and less wet than the Medela ones. One Medela wipe is enough for me to clean the full set of parts I use in a day, whereas when I tried to do the same with the Munckins I was using approximately 5 to do it. This method of using wipes and the steam bag (each steam bag can be used 20 times, i.e. for a whole month of an average work schedule) allows you to clean the parts at work without needing brushes, a bowl of soapy water, or 20 minutes. Everything comes out sterile in approximately 5. They can also be used with almost any commercial personal breast pump (a couple of the Freemie parts are the only exception to this that I've seen - some of them are not rated to be steam cleaned). 3. 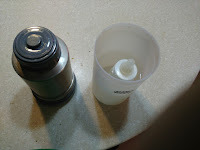 Once the steam bag is done in the microwave, simply dump the water into the sink and the parts back into the now rinsed container you had been keeping the parts in while in the fridge. Store the container open to the air overnight (hopefully in the pumping room) to give them a chance to dry out. So you want to breastfeed your baby in the 21st century? Well little lady, buckle up... this is going to take some equipment. (This is of course, assuming you want to leave your baby's side ever in their first year, or however long you want to breastfeed for). We'll get to breast pumps and things you need to pump at work in some other posts, but this post will be about storing breast milk. Should you find yourself lucky enough to have adequate supply to start a freezer stash, I would recommend doing so. (If you do not find yourself lucky enough to have an adequate supply, worry not. If you're reading this, I assume you find yourself living in or after 2015, a fantastic time in human history when we can just buy baby food in the grocery store and feed our babies. The future is a pretty rad place to live.) The freezer stash is great if your supply drops when you're sick (true for me and many, though not all, women). It's also great if you need to travel or have the luxury to drop the kid off at the grandparents for the weekend or otherwise extended babysitting. Every time I add a bag to my stash, I stroke the bags already in there and make the "my precious" sign, while mumbling to myself (I don't actually, but it does give me peace of mind that if I die, my husband could feed the baby for a couple of days before having to go out and buy formula). So back to the practical advice... I would recommend getting an organizer box to store your milk. The organizer box I recommend is the First Years Breastflow Milk Storage Organizer . Why do I recommend this? Well, if you freeze your milk in bags (which I also advocate, because freezing it in bottles takes up an insane amount of space and costs an insane amount of money spent on bottles), the bags freeze funny on their own and are difficult to store. This convenient contraption makes them freeze flat and gives you handy box to store the neat flat bags. You can even use the lid for additional storage space if you build up a big enough stash. Also, any brand of bag will fit in the box so you don't have to commit to a "system". The photo to the left shows the current milk contents of my freezer - a full lid, with space still left in the main box; currently one bag is in the process of freezing under pressure. If you look carefully you'll see 2 different brands of freezer bags being used. What about the competition? There are a number of popular "systems", none of which I can frankly recommend in good conscience. Here's why. 1. The most popular solution I've seen based on extensive time spent in baby stores over the last couple of years is the Kiinde Breastmilk Storage Bag Holder and Organizer . Their big pitch is that you can pump directly into their bags and their bags are recycle-able. I'm super pro recycling, but that's where their goodness ends as far as I'm concerned. There are a number of other brand bags that you can pump directly into. For the same amount of space (approximately) that their solution stores 12 bags, the organizer in my freezer currently is storing about 20. 2. The other solution I frequently see is Medela Breast Milk Freezer Bottles. These I personally find ridiculous. They are 2oz each - an amount of milk most of my babies surpassed eating by 6 weeks. That is a massive amount of freezer space to give up in order to store 24 ozes of milk.